There is nothing better than a comforting pot of chili just about any time of the year, and we do love our chili here at the cottage. 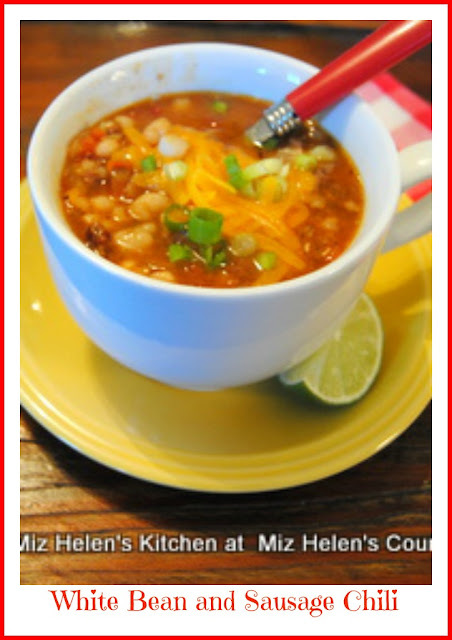 This recipe is a hearty chili with a bold flavor and is a little different because I used sausage for the meat in the chili and it is fantastic! I knew it was going to be a great recipe when I could smell it cooking and folks coming in the door would say, what in the world smells so good? We really enjoyed this recipe and sure hope you do! I use the Quick Soak Method for my beans. Sort and wash the beans. Pour the beans in a large pot with 6 to 8 cups hot water and bring to a rolling boil. Boil for 2 minutes, then cover the beans and remove from the heat. Let stand for 1 hour, drain and rinse the soaked beans. While the beans are draining, in the same bean pot, brown the sausage. When the sausage is browned, add the onion and cook until clear. Add the tomatoes and green chilies, mixing well. Add the beans,garlic,salt, pepper,chili powder and cumin. Mix the seasons into the beans and sausage. Pour in 2 cups chicken broth and 4 cups water, mix well. Cover and cook on low to simmer for 2 hours. Or in a Slow Cooker on low for 3 hours. This recipe freezes very well for up to 3 months. It is so much fun when you can come by and spend some time in the kitchen with me, food is always better with a friend. Hope you have a fantastic week and come back to see us real soon! Just a pork and sage blend of sausage. There are so many different kinds of sausage today, I just call it country sausage, but I probably need to correct that, thank you! Thanks so much for stopping by, it is always good to hear from you. Sounds delicious and is a great one for the freezer. I am always on the lookout for soups that can be frozen. This looks so warming and delicious! Thanks for sharing on the What’s for Dinner link up and don’t forget to leave a comment at the party – Next week’s features that also leave a comment get pinned, yummed and tweeted! Yum! This sounds delicious. I can't wait to make it. Thanks for sharing.